As you are reading these remarks, try to flag these cards in the back of your mind so you will watch for their appearance over the next month. The purpose of these little excursions through the Icon is to help you "carry the light" from the heavens down into the cards in your hands, thereby translating current events in the light of the Cosmos. Keep an eye out for appearances of 7 Planetary Governors and the way their current transits are playing out here in the sublunary realm. Each Planet's placement sets loose a whole set of consequences that emanate from the Trumps bearing their signatures, pouring into the Signs they occupy and out through the related Royals and Pips that share those activated regions. NewMoon in June (the Priestess joining with the Fool) happens in the third decanate of Gemini, lighting up the 8 of Swords (running the gauntlet). Related cards that are engaged by this event are The Chariot (the astral double), Knight of Swords (trickster) and 10 of Swords (the soul awakens from the body). Venus retrograde (Empress) with Jupiter (Emperor) and South node in the1st decanate of Gemini also activates the 9 of Swords (learning from harsh experiences). This month the focus is on Gemini, where we find roughly a third of the Solar system including the Syzygy of the Lights (NewMoon). This is our second NewMoon in the same sign, making this a "blue moon" according to some modes of parlance. This is a natural occurrence -- the Moon makes 13 revolutions a year, so one sign is always duplicated. But considering that over the last month, Gemini has also been the reference point for both a Solar and a Lunar eclipse as well as the recent Venus maneuver, it seems fairly clear that the Inner Child is getting its cage rattled. Can we finally come untangled from those ancient early-developmental issues? Are we ready to come out and play yet? The cards for all this Gemini action are marked by struggle and stress. The Chariot card gives us the clue, because only a warrior can steer Athena's war-chariot. This aspect of challenge and rigor doesn't imply that there is anything "wrong" with Gemini energy, far from it! Gemini is the first Air sign of the Zodiac, and it therefore symbolizes the first dawning realization of the predicament that the (eternal) soul is faced with because of its investment in (mortal, living-and-dying) matter. Through history, the Zodiac has offered an archetypal 12-step sequence that details the journey of human consciousness. As the third step after birth (Aries) and the stabilization of the body (Taurus) Gemini offers the very first opportunity a freshly incarnated soul has to become self-conscious. For humanity, self-consciousness is a stressful and challenging acquisition. We learn through experiencing pain, through making mistakes, through bumping up against the solid objects around us as we toddle our first steps. The only reason an infant doesn't give up in frustration with the difficulties of gravity, hunger, exhaustion and confusion, is that their growing bodies and brains are innately optimistic, having no negative programming yet to deter their curiosity. Gemini consciousness wakes up curious, interested, and willing to experience whatever challenges the new day brings. Gemini energies don't need to 'psych themselves up' to find their motivation, nor do they plan their process very tightly. They just respond as things happen, experimenting as they go, often winning by losing. Usually, it is only after the situation is all over that they fully understand what they were up against. Like the bumblebee, Gemini energies guilelessly face down impossible tasks every day, because nobody told them they couldn't. Mercury (the Star) in the third decanate of Cancer (3 of Cups) energizes Justice, the Queen of cups and her Page. Mercury whizzed through his home sign of Gemini this last month, and didn't we feel smart and snappy at the time? Now he is two-thirds of the way through Cancer, so his quicksilver imagination is currently focused on the emotional and psychic sphere of the inner life. The cluster of cards being activated shows this moment as an opportunity for adjustment, adjudication, and equilibration within the emotional body. I would say this represents an opportunity to balance out our intuitions and feelings, to feed and attend all of our inner facets with careful discrimination. We are advised to organize our inner lives in a manner that resembles a varied but harmonious family of unique and bonded individuals. If you imagine your immortal soul tending to its incarnations the way a mother feeds her children, you will get the idea. The love and care being meted out here express the tender nurture of a benign parent for treasured offspring. Realize that you are a wanted child in a loving universe, and then share that love through all of your relationships. Mars (Strength) in the third decanate of Virgo (8 of Disks), energizing the Wheel of Fortune, Knight of Disks and 10 of disks. Mars has just now caught back up to the place he had attained before his retrograde started back in late January, so we can finally finish picking up dropped stitches. Free to leap from the start-gate anew, we can count on Mars' steady support again for the next two years, until his next retrograde in March of 2014. Look around you right now and notice the stage of the harvest (Virgo) your Mars is engaged in. These very circumstances represent the launching pad for your next Martian cycle. You have two years in which to complete the next stage of your aspirations with Mars' help. Mars has benefitted tremendously from the recent Earth Trine shared between himself, Jupiter in Taurus and Pluto in Capricorn, variations of which shimmered in the heavens for several months. Now is the time to consolidate and 'bring to Earth' everything that Mars learned during his retrograde, while in tutorial with Jupiter and Pluto. Take practical steps to render that learning into tangible and commercially viable form. Millions of people all over the world are sitting at home tinkering up our incoming future culture. See what you can add to the process. Saturn (Judgment) retrograde in third decanate of Libra (3 Swords) energizing the Hanged Man, the Queen of Swords and her Page. This is the sign of Saturn's exaltation, but his pleasure in this placement is somewhat compromised by the retrograde motion. We are very close to the end, his retrograde ends June 25th, and so we can all be thankful for that. With Saturn still in the decanate of the 3 of Swords, I hope everybody is working hard to keep their communications positive, helpful, clear and free of projections. Pluto (cosmic Fire, the World) retrograde in the first decanate of Capricorn (Ace of Disks) energizing the Tower, the Queen of Disks, and the Page of Disks. Nothing much has changed with Pluto over these last few months. Now that he's nearly 1/3 of the way through the sign of Capricorn, we are getting used to this influence -- it doesn't seem so novel or revolutionary anymore. What is new right now is that due to his retrograde, Pluto is now engaging in a very sharp square with Uranus. These two outer planets are exchanging static across the first decanates of the Cardinal signs of winter and spring, bringing contrasting styles, agendas and methods to their conversation. To me, the idea of Pluto retrograde in Capricorn suggests toxic conservatism that is actually destructive of the future it pretends to be protecting. Meanwhile, Uranus in Aries points to unfettered personal freedom unmoored to any group organism or collectively-held 'greater good'. The point where these two massive vectors converge could witness a titanic struggle for sovereignty. While the radical conservatives try to crank the world back to the Middle Ages, the equally radical libertarians and individualists make their escape bids, disappearing into parallel realities. Who or what is left to hold the center? It looks to me like Uranus (see below) gets the upper hand. Neptune (cosmic Water, Death) retrograde in the first decanate of Pisces (9 of Cups), energizing the Sun (Trump #19), the Knight of Cups and the 10 of Cups. All I can think of when I look over this cluster of cards are words like dissolving, melting, surrendering and yielding. Clearly the process isn't all bad! Think of how it feels to relax into a comfortable sleep, or kick back for a siesta on a lazy holiday. There is no sense of loss or grief, only a gentle unclenching as we release ourselves to the doze. Looking at Apollo playing his lute for the lovers in their friendly recline, and the troubadour Knight of Cups with his sense of homecoming, it seems as if Neptune in this 9 of Cups placement is inviting peace and closure for all those issues that have troubled our souls in the past. Whatever else is going on in the world, Neptune expressing through Pisces is going to help us discriminate between the superficial ephemera and the things that really matter in an eternal sense. Perhaps it will help us open up our psychic senses as well. While crossing these early degrees and while Neptune is retrograde, it can be hard to sort out what is real and what is illusion. Summarizing the green dragon of the Death, the 9 of Cups and Apollo, I'd say just relax about it instead of clenching up and getting disturbed. Neptune won't straighten out again until mid-November of this year, and at that point he'll be back in the very first degree of Pisces again. Between now and then, we've just got to trust the flow. Uranus (cosmic Air, the Magus) in the first decanate of Aries (Ace of Wands), energizes the Hierophant, the Queen of Wands and the Page of Wands. As long as Uranus is in Aries, we will be barraged by this theme of coming awake to our higher nature (the Hierophant is the Initiate or thrice-born). The immediate result is that the Magical Imagination is understood to be especially "lit up" and focal as we use our cards for clients. This phase doesn't finish until March of 2018, so clearly we'll be given a lot of chances or transcend our previous limits and learn to thrive in a higher frequency of energy. I have wondered most of my life just what it would take for the species as a whole to wake up to their energy-bodies, instead of relying upon a relatively few self-chosen "sensitives", thereby leaving everybody else out of touch and struggling for meaning. If something could trigger those dulled subtle senses and give all humans the signal, we could all finally jump into our collective telepathy as one, and blow past the small-minded illusion that each one of us lives in a separate and unique bubble impervious to every other. Maybe having Uranus transiting Aries for the next six years will do the trick! 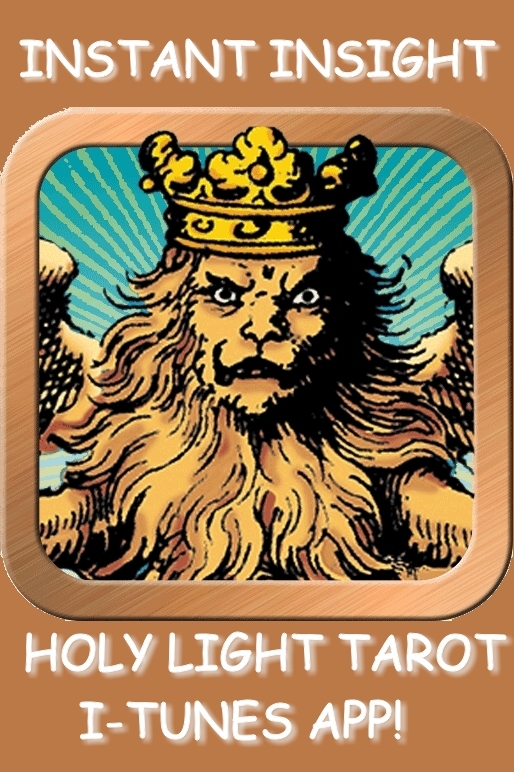 Try imagining that, every time you see the Magus card, a higher intelligence from outside your private universe is trying to get your attention and add to your Light. What could you do with such a boost at a time like this? As you can see in the drawing, I have included only the 30º aspects, so that you could better understand the astrological approach that was practiced before people had computer calculations at their fingertips. Aspects were 'eyeballed' and often just sort of approximated. Even breaking the signs down to 10º segments and confining aspects to their cognate decanates would have been seen as precision in many contexts. When wearing my astrologer hat, I have always insisted on tight orbs and rigid calculations. But this is not the world our esoteric ancestors lived in! There are multiple oracle systems that were current in the days when Tarot was still young, which used Astrological style charts and vocabulary, but which substituted some form of "lots" or random generator to stand in for numerical calculation. 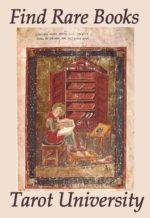 Our Icon gathers the best of ancient and modern esotericism, and allows us to cross-translate these wonderfully rich old practices into our modern Tarots. According to the Ptolemaic basis of astrological practice, the aspects are governed by the planetary pattern called the Ladder of Lights. By that I mean, if one takes a station as the Sun at Leo and then look forward in the Zodiac towards the fall and winter signs, one sees that Mercury characterizes the semisextile (in Virgo), Venus the sextile (in Libra), Mars the square (in Scorpio), Jupiter the trine (in Sagittarius), and Saturn the inconjunct (in Capricorn). Saturn ends up with the opposition as well, since he rules both Capricorn and Aquarius. (The same pattern appears if one takes a position as the Moon in Cancer and looks backwards through the Zodiac to the Winter Solstice.) The ancients normally didn't like or use the semisextile or the inconjunct aspect, considering them both to be paradoxical and tricky. For this very same reason, I do use them! The colored lines laid over the Icon detail the current aspects, indicating styles of interaction that mimic the innate predispositions of the Planets. I'll point out a few of the strongest relationships in this chart and you can amuse yourself with imagining how these exchanges might play out in practice. There are two different complexes aspect here, and they are each isolated to opposite sides of the Zodiac, with the Nodes providing the dividing line. The more widespread group contains all three outer planets, the Nodes and Jupiter/Venus. The other group contains the NewMoon, Mercury, Mars and Saturn. The dividing opposition is heavily weighted at the South Node in Gemini. This axis and everything that aspects it engages the first decanate of each sign that is involved. Different aspect families tie all the three outer planets into the opposition: Neptune is stressfully t-square the Nodes, Uranus has a very harmonious trine/sextile relationship with the Nodes, and Pluto extends the paradoxical and tricky inconjunct/semisextile pair. The 3/4/5 triangle joining Venus, Neptune and Pluto is particularly complicated and interesting! On the other side of the opposition, the smaller composite figure has as its base the trine between NewMoon and Saturn. Both sides of that trine are receiving squares -- NewMoon from Mars, and Saturn from Mercury. Mars and Mercury seem to be in cahoots, being linked together by a sextile. This looks like a great figure for harnessing stress and challenge to a collective goal and using it to power progress. This whole group occupies the final decanates of their respective signs. Both of these figures remind us that in life, nothing is ever simple or linear. There are always ramifications, blessings always contain their setbacks, and seemingly bland interactions can hide unfathomable hidden depths. I might suggest relating to these two aspect patterns as if they were the two hands of one thing, or even round-table discussions between different facets of one thing. In a circular model like astrology or the THL Icon, this is better than viewing the Planets as separate players doing disconnected things. After all, everything that goes around comes around. Energies and attitudes ping-pong back and forth along these closed channels, stimulating the cluster as a group, no matter which planet started it or what order things are hit and respond. As a closing treat, I'd like to introduce you to http://darkstarastrology.com/new-moon-june/. What a fabulously Venusian interpretation of current events! The author Marina is calling for a Kitchenware Revolution -- a creative response to the macro-issues looming over us all. Her remarks include the influence of the asteroids, fixed stars and Sabian Symbols, which I tend to ignore in these essays. I wish you all a fruitful and clarifying summer. Thank you for your wonderful support, and may we all enjoy the season to the fullest!